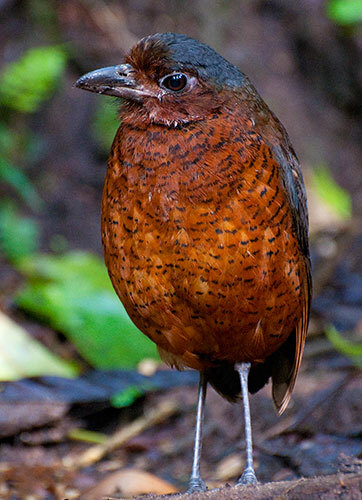 The Antpitta, sometimes referred to as a “ground antbird”, is a plump little creature that stands majestically on its long legs. It is a woodland bird, hopping around the forest floor in search of insects, worms and other delicious morsels. It is combined with the antthrushes within the family “Formicariidae”. Although not a spectacularly ornate animal, its song can be beautiful and alluring. They are shy and allusive, generally heard and not seen. In Ecuador there are twenty-three species of Antpitta in five genera. Some birds, such as the Giant Antpitta, are difficult to find and are listed as threatened by the IUCN (International Union for Conservation of Nature). Even the more abundant species are seldom seen although frequently heard. 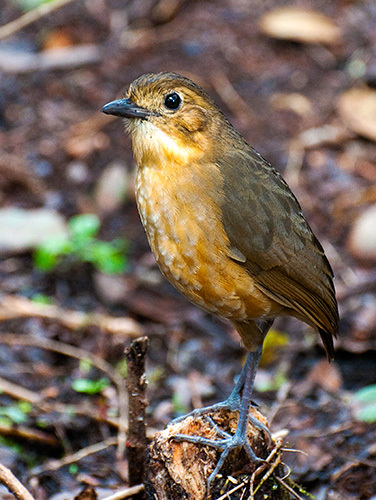 Antpittas are curious little birds with rotund, egg-shaped bodies that sit upon long spindly legs. They have short, stout bills and virtually no tails. This intriguing creature is reminiscent of Humpty-Dumpty with legs. As is common with birds of the forest floor, colors are muted with shades of browns and grays. Some species, however, sport patterns that can be quite attractive. Antpittas are very shy and stay hidden in the forest undergrowth, avoiding most human contact. They can be located at most altitudes, ranging from the coastal planes to the Páramo. More often heard than seen, their haunting melodies enchant the curious traveler. Any glimpse of these elusive creatures is a boon to the avid birdwatcher and a cherished memory. There are, however, locations in Ecuador where some species can be viewed on a regular basis. Angel Paz, at Paz de las Aves (Birds Peace) near Mindo, has befriended a variety of Antipittas and visitors can observe birds such as the Giant, Mustached, and Yellow-breasted Antpittas in their natural environment. Antpittas feed on insects and worms, scratching around the leaves and undergrowth of the forest floor. They generally forage alone, although they will remain in contact with their mates through vocalization. There vociferous call will also settle territorial disputes that may arise. Typically they can be heard in the early morning and late evening, although the Tawny Antpitta may sing throughout the day. The Antpitta is a amusing little bird that can delight the enthusiastic traveler with its melodious song. Those who are fortunate enough to get a glimpse of this curious creature will have a memory that will become the highlight of their trip. When walking in the rainforest, be attentive to its song and stop for a moment of silence. By some blessed touch of fate this elusive little creature may appear and bring sunshine to an otherwise ordinary day.